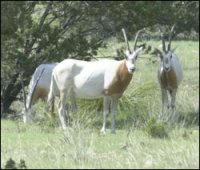 Weighing around 440 pounds, the Scimitar Horned Oryx has a white coat with a red-brown chest and black markings on the forehead and nose. Calves are born with yellow coats, and their distinguishing black marks appear later in life. Scimitars are very social animals around one another, and generally travel in large herds of up to 70 animals. Native to Africa, males and females both have horns, which are 3 - 4 feet long. These horns are very thin and can break easily, but make beautiful mounts. Scimitars are available for hunting year-round.